Liverpool manager Jurgen Klopp has urged supporters from both his club and Roma to avoid conflict ahead of Wednesday night's Champions League semi-final second leg in Rome, as he again sent out another positive message to stricken Reds fan Sean Cox. Mr Cox is fighting for his life after suffering severe head injuries in an unprovoked attack by Roma fans before last Tuesday's first leg at Anfield, with both clubs uniting in their support for the Irishman in recent days. There are fears that Roma fans will attack Liverpool fans once again in the Italian capital, but Klopp sent out a firm message as he pleaded for calm. "We all have the same opinion, it's a football game and the fight is only on the pitch," he declared. "That's clear, it was always like this and it should only be like this. "Sean Cox should feel our support and his family should feel and hear our support. It was right what we said about that and now I hope that tomorrow all the people can walk to the stadium and look forward to a fantastic, intense and very important football game. I really hope that will be possible." Roma's players laid a wreath at the memorial for Liverpool fans who lost their lives in the Hillsborough tragedy at Anfield last week and wore shirts sending a message of support to Sean Cox in training on Tuesday, with Klopp welcoming those sentiments from his rivals. "Great gesture," he said of the shirts players wore with Forza Sean emblazoned on the front. "I really thought Rome already showed a fantastic gesture for the 96 at Anfield. These two teams deserve to be here because they show the maximum respect for the other side. They're a fantastic side with a great mentality. "In these moments, all football fans should really stay together and show this kind of respect, so I love the gesture." 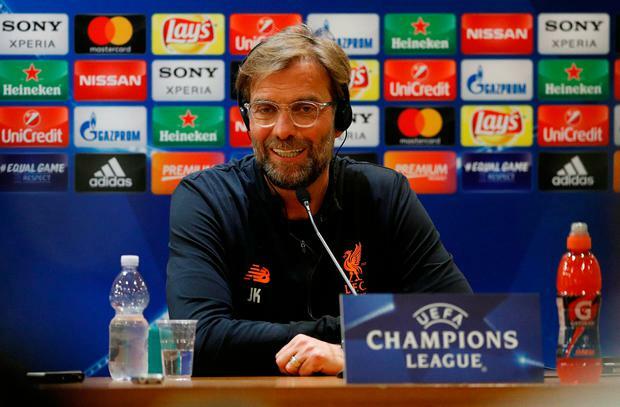 Klopp went on to insisted he did not need to fuel the hype around the clash with Roma at the Stadio Olympico, as he was keen to highlight the positive position his team are in after last week's thrilling 5-2 victory. "This is a very big occasion," he continued. "It's great to be here, it's great that the boys gave us the opportunity to be here with all the things they did during their Champions League campaign. "We deserve to be here. We are here to fight for our dreams, that's how it is. We want to go to the final. We are still 5-2 up and meanwhile people think Roma ‘only' need to win 3-0, but that's quite a result. "There's a football game to play and I'm really looking forward to it. You want to play for the big stakes. "It's all about us to be active and be difficult to play. It's just like it is, there's no perfect plan for it. We can cause problems here or there, that's all we can do and then we play it. "You have to be brave, we need to play football and use their situation much more than they can use that. "If you have to win against us, you need to take a risk and if we concentrate, we can make it difficult. We could have scored seven or so last week, it's not disrespectful. "Sadio Mane could have scored twice, Mo Salah had other chances. It's not decided, we know that can happen and in the game we need to show that."